A 1 Day Singapore Must See itinerary lets you see impressive international gardens, a world class shopping district and some of Southeast Asia’s best hawker food areas. Our one day Singapore itinerary covers all of the highlights of modern Singapore, along with a variety of dining and nightlife recommendations to help you get the most from your trip. We’ve also included accommodation recommendations for all price ranges, most of which are located in and around Orchard Road, Marina Bay and Chinatown. These areas are all close to the MRT, making them ideal if you want to get around Singapore quickly and cheaply. Getting into Singapore from Changi Airport is easy. Trains leave from the airport to Tanah Merah station on a frequent schedule, starting at 5:31am on weekdays and Saturdays and 5:59am on Sundays and public holidays. From Tanah Merah, it’s easy to use the MRT system to get to almost anywhere in Singapore’s central districts. Taxis are also available from Changi Airport to anywhere in Singapore. It takes about half an hour to get to the city from the airport and costs anywhere from $20 to $40 or more, plus an extra few dollars for surcharges depending on the time of day. Once you’re in Singapore, getting around the city is a breeze. Our one day itinerary uses the MRT to get around, since it covers all of Singapore and saves both and money compared to using taxis. Our one day itinerary starts with a quick visit to Merlion Park, where you can see the two famous Merlion statues — the ‘cub’ and its ‘parent’ statue — that are icons of Singapore. The statue park offers a great view of Singapore’s CBD and Marina Bay, where we’ll be heading next. 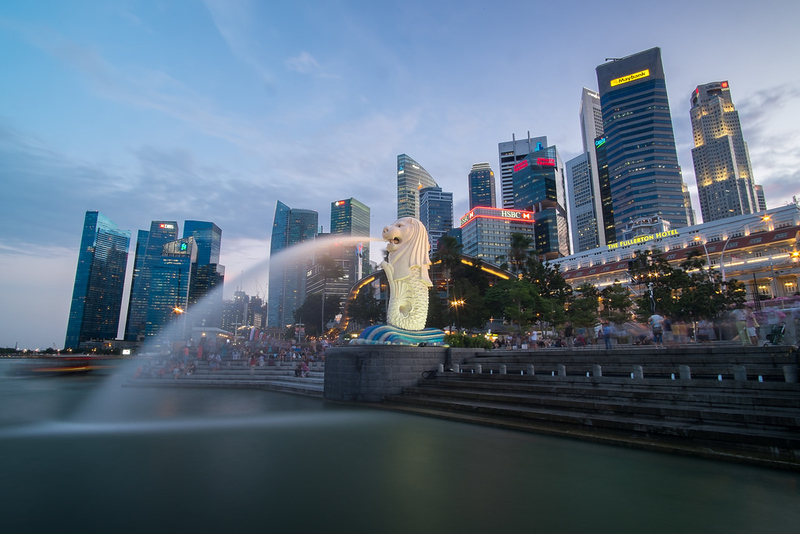 Merlion Park is located on the harbour side of One Fullerton, a short walk from the Raffles Place MRT station. Built on 250 acres of reclaimed land, Gardens by the Bay is a large waterfront garden complex that’s home to exotic plants from every continent except Antarctica. The complex features two cooled conservatories, one of which is the world’s largest columnless glasshouse. There are also several ‘Supertree’ vertical gardens reaching up to 160 feet in height that contain a diverse range of vines, orchids and other plant life. As well as the amazing plants on display, the gardens offer some of the best unobstructed views of Singapore of anywhere in the city. As of 2017, admission to Gardens by the Bay is $28 SGD for adults and $15 for children, which includes access to both of the conservatories. The OCBC Skyway is an extra $8 for adults and $5 for children. There are also free outdoor gardens that can be accessed without a ticket. 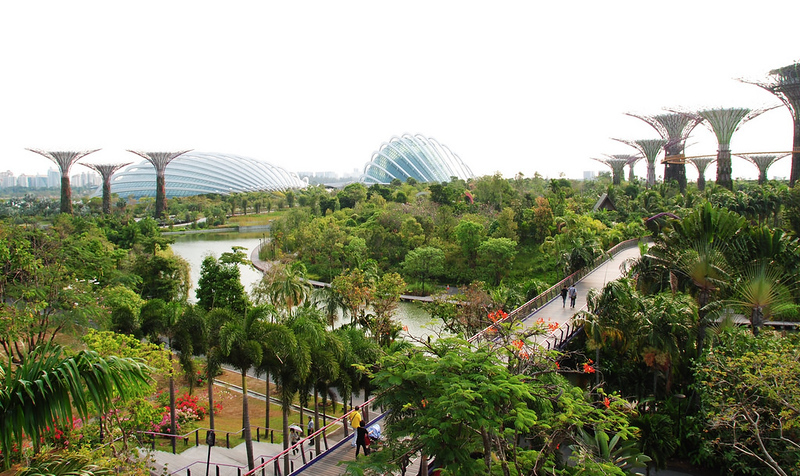 The easiest way to get to Gardens by the Bay is by MRT. The gardens are closest to Bayfront MRT station, although it’s also possible to get off at Marina Bay MRT station (easiest if you’re coming from Merlion Park) and walk through the shopping mall to the park entrance. Affordable and authentic dining options around Gardens by the Bay are limited, meaning you’ll want to go elsewhere for lunch. There are two convenient dining areas nearby — the more old school, authentic dining in Bugis Food Village or one of the food courts on Orchard Road. Bugis Food Village is a classic hawker centre, with a diverse selection of Malay, Chinese, Thai and Indian food stands to choose from. 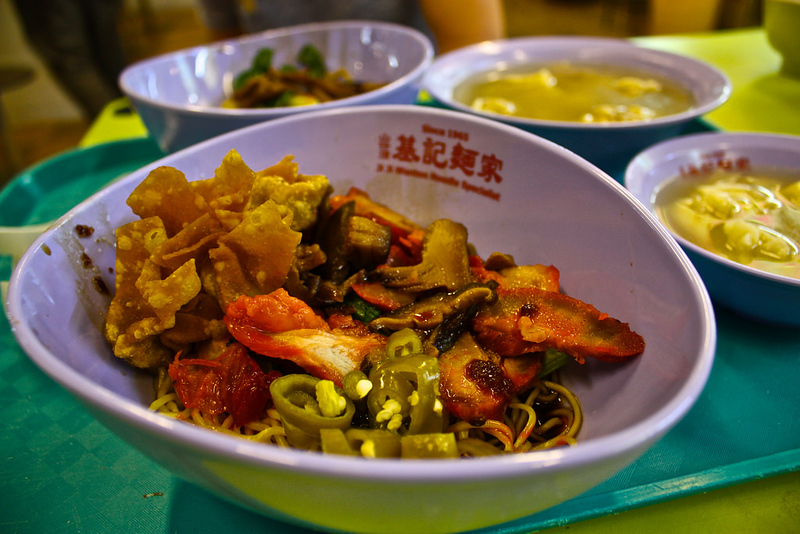 If you want to eat lunch like local Singaporeans do, this is the place you’ll want to go. The food village is a short walk from Bugis MRT station, which you can get to on the Downtown Line from Bayfront MRT station near Gardens by the Bay. If you prefer air conditioning to fresh air, you can also eat excellent Singaporean food at many of the indoor food courts on Orchard Road. Most of of these food are located inside malls, making them a more convenient option if you want to go shopping after you eat. Far from the cheap, low quality fast food you can eat at most Western food courts, the shopping mall food courts in Singapore serve excellent food at prices that are barely higher than what you would pay at a hawker centre. Some of the best food courts around Orchard Road include Food Opera, which is located in the basement of ION Orchard, and Food Republic, which is on the fourth floor of Wisma Atria. Our afternoon itinerary covers the National Museum of Singapore and Orchard Road, the city’s main shopping area. Singapore’s oldest museum, the National Museum of Singapore contains a variety of exhibits showcasing Singapore’s natural, political and cultural history. The museum covers the entire history of Singapore, from the Kingdom of Singapura era to WWII and today. Located a short walk from Bras Basah MRT station, the National Museum is also within walking distance of Bugis station. As of 2017, tickets are $15 for non-resident adults and $10 for seniors and students. 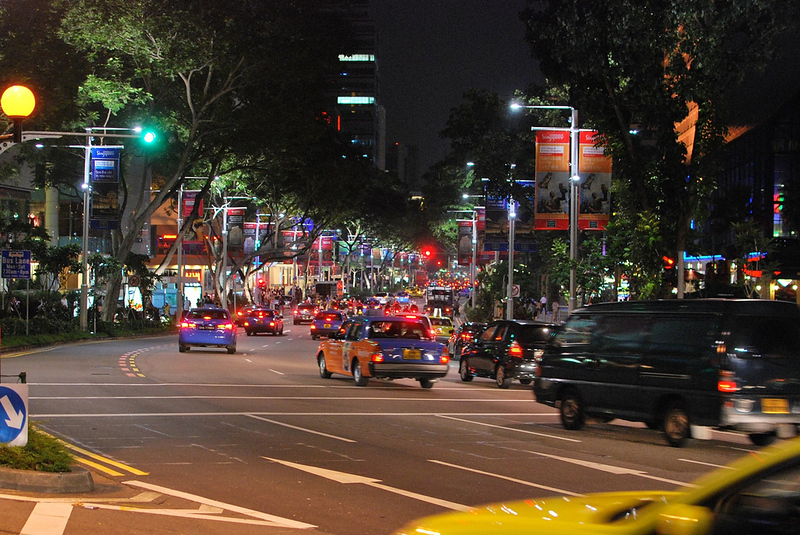 Orchard Road is Singapore’s iconic shopping street — a long, leafy and highly walkable stretch of luxurious shopping malls, department stores and retail shops selling everything from high-end fashion to consumer electronics, souvenirs and more. It’s also one of Singapore’s busiest areas, attracting a mix of locals and tourists every day of the week. If you’re in Singapore to shop, this is where you’ll probably want to spend the majority of your time. ION Orchard. This modern shopping mall is a great place to shop for high-end and high street fashion. It also has a great food court with a selection of affordable restaurants. Orchard Central. One of the best malls on Orchard Road for high street fashion, this is where you’ll want to be if you’re looking for mid-priced clothing. There’s also a climbing wall and art gallery inside the mall. Far East Plaza. This older mall is a great place to hunt for bargain clothes, accessories and souvenirs. Most of the stores here are small, independently owned businesses, with few chains compared to the other malls in the area. For local street food served in classic Singapore shophouses, head to Chinatown and enjoy a cheap meal on Smith Street, where you can find a great variety of hawkers and local restaurants. Another good budget dining option is Maxwell Road Hawker Centre, which has one of the best selection of food stands of any hawker food court in Singapore. 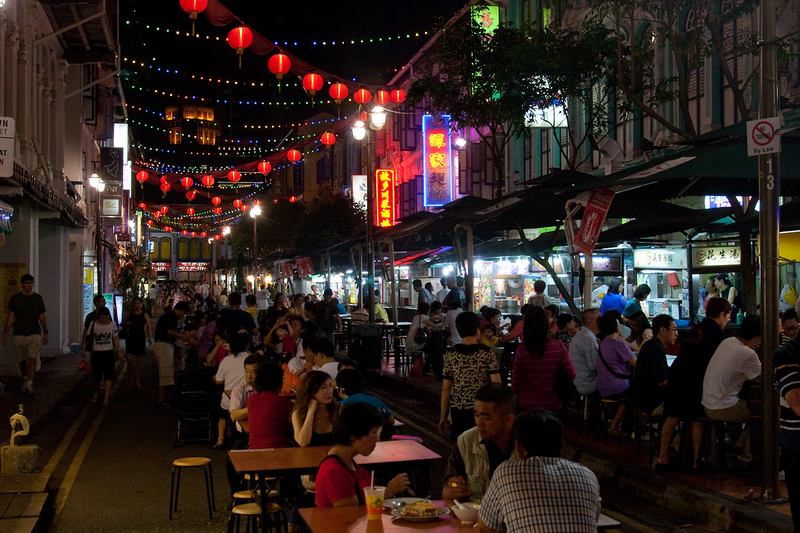 Clarke Quay is where you’ll find most of Singapore’s international restaurants, as well as a good selection of bars. This area is undeniably touristy but still a fun place to enjoy a night out surrounded by the Singapore River and the city’s modern skyline. If you’re looking for fine dining, an unbeatable view of Singapore and don’t mind paying premium prices, Sky on 57 is a great option for a romantic dinner followed by cocktails. 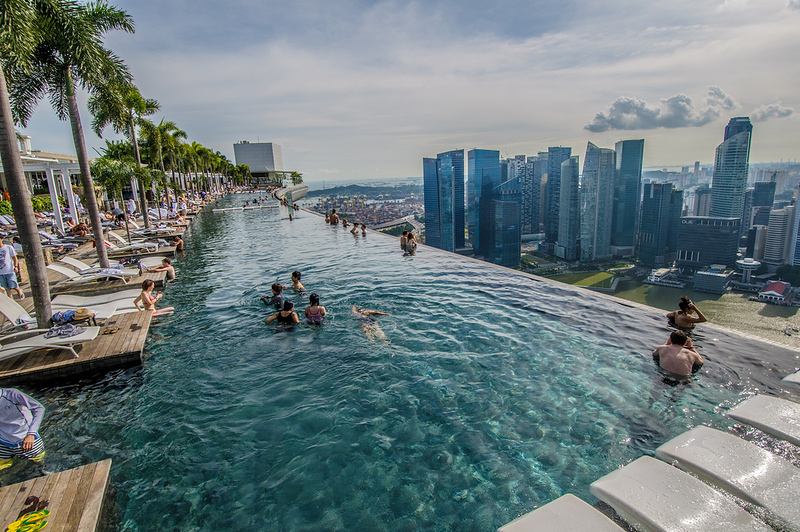 Singapore has a large selection of luxury and mid-range hotels, meaning you’ll have plenty of choices if you’re travelling on a reasonable budget. Keep in mind that rooms in Singapore are usually slightly on the small side compared to Western hotels, with prices on the high side. While Singapore isn’t a great destination for budget hotels, there are several good guesthouses and hostels located around the city. Most of our budget recommendations are located in or near Chinatown, where you’ll also find some of Singapore’s best cheap shopping.